Mr Wilfred Bateman of Northop, aged 95 and Mrs Jacqueline Jones of Flint, aged 75, were the first to move to the scheme when it opened this week with Mr and Mrs David and Margaret Robinson, from Flint aged 81 and 84 also staring their tenancy on the same day but moving in later in the week. A phased move-in period has been arranged to minimize disruption for the new tenants, who each have their own self-contained apartment as well as access to a wide range of communal facilities and access to 24-hour support. 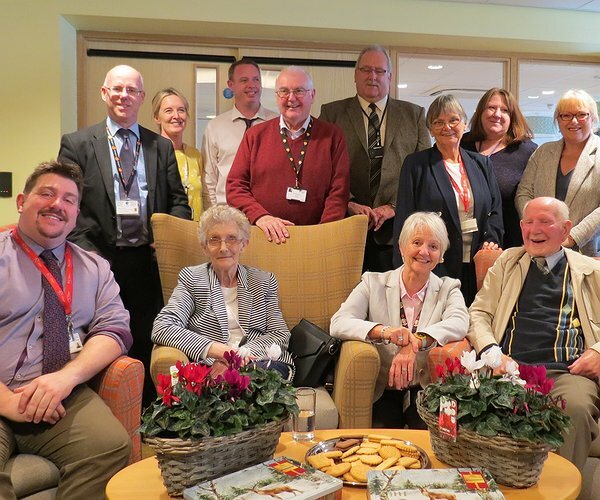 “It is an absolute privilege to welcome the first people to this important scheme which provides an excellent housing option for older people who wish to remain independent, while having the peace of mind that extra care offers,” said Dr Horrocks. Cllr Aaron Shotton, Leader of Flintshire County Council added: “It is fantastic to see the transformation of Flint Town Centre of which the new Llys Raddington Scheme is huge part, and to see the positive impact the scheme will have on people from across Flintshire for decades to come. The scheme also features a residents’ restaurant, communal areas and activity rooms as well as landscaped grounds, carparking and a mobility scooter store with 24 hour on-site care support. There are additional assisted bathing rooms and there’s even a ‘sky-lounge’, a conservatory area on the roof. Llys Raddington is a partnership development between Flintshire County Council, the Welsh Government and Tŷ Glas Housing Society, part of the Pennaf Housing Group. The scheme will be managed by Clwyd Alyn Housing Association, which is also part of the Pennaf Group, and individual domiciliary care support is provided by the Local Authority. "Clean-up at local beauty spot"
"First tenants welcomed to Hafan Cenfi extra care housing scheme"